Centralize and share project resources using the repository. Multiple projects, i.e. team members, can share the same resources by setting a common location for the repository, for example a network shared drive. Resources exported to the repository can be used in new projects very easy. For dialogs and prerequisites use the option "Add from Repository". Dictionaries are automatically loaded in the project if their correspondent language is selected. Project templates and repackager profiles are also automatically loaded from the repository and populated in our GUI, so you can choose to use the one you need when creating a new project or respectively repackaging an application. Change the repository location on your development machine. This value can also point to a network path. Change repository path - changes the location without moving the resources inside. Move repository - changes the location and moves the containing resources replacing the identical ones. We will gladly offer you a free license if you help us with missing translations. To contact us regarding this, just use the “Send to Advanced Installer team” item from the Dictionaries tab's context menu. Merge Modules - can be exported to the repository from the Merge Modules Page or from the Repackager or Detect MSM wizards. Also, you can use the "Add..." context menu from the "Content" pane. 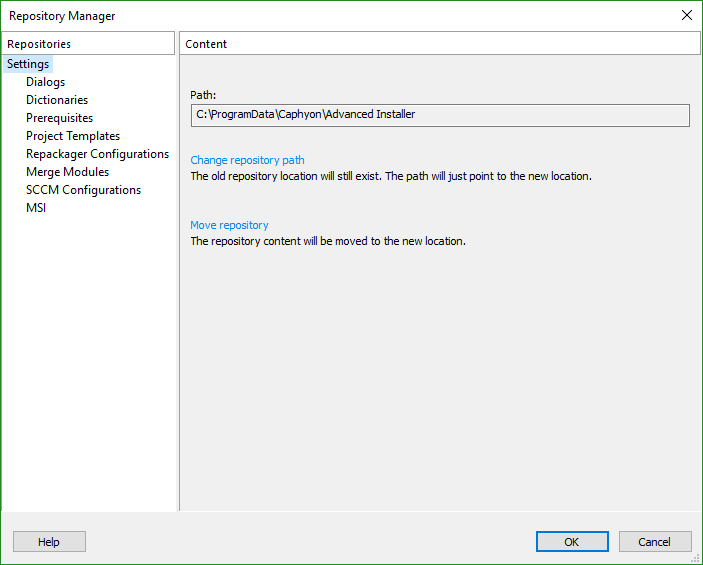 SCCM Configurations - new or duplicated SCCM configurations will be automatically exported to the repository from Edit SCCM Configurations dialog. MSI - add MSIs to the repository when using the Conflicts Detector Wizard from the Select MSI dialog. Also, you can use the "Add..." context menu from the "Content" pane while "MSI" is selected in the "Repositories" pane. To remove a selected item from the repository just right-click to access its context menu or press the Del key.